I LOVE to do parties..LOVE LOVE LOVE and my children LOVE it when I do and they always have a special request for the theme of their parties. This one loves under the sea I have done it for the past couple of years for him and this year was going to be no different....UNTIL....i was doing some last minute things on his room so we could present it to him most of the way done for his birthday and then I hurt my back. I sat down on the chair in their room and thought it was going to be okay. I decided I would take some ibuprofen and press on. I journeyed down the stairs and hit my hand on the wall and the tears started flowing uncontrollably, the pain was excruciating and with the realization I was done for the day and we were not going to be having the birthday party in which I had intended sobbing ensued.. As the day went on I thought I might be able to pull it off and then this loud voice in my head started shouting "no take care of yourself everything will be fine" so I went with that. I did manage to take them to their swimming lessons and on our way back home I decided if I had them carry and pick up everything at the store I could do something. I could at least have a cake that he would love and easy for me to do and I did. 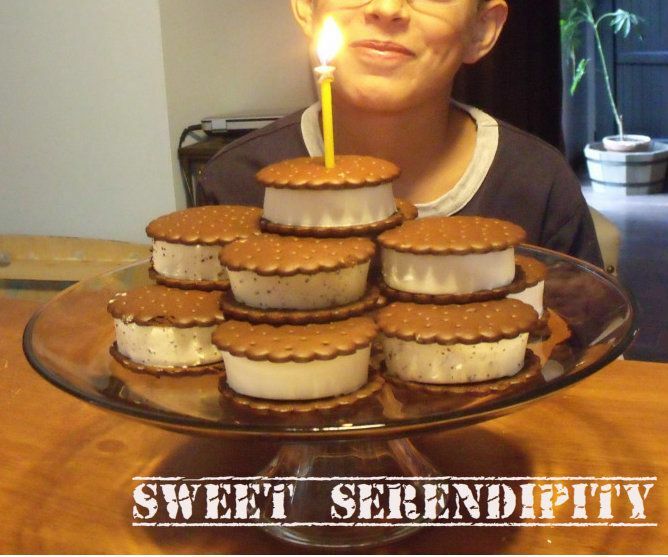 I bought 2 boxes of circular shaped ice cream sandwiches and placed a layer in a circle on a cake plate and then added another smaller layer and then placed one on top with a candle. We also ordered his favorite pizza and let him take a peek at his room which he was so excited about even though it was not finished. He loved seeing all the pieces we had been working on and he could envision what it was going to look like when it was done. As you can see by the smile on his face he Still had a Happy Birthday!! !